Record label: Marvelous Entertainment Inc.
Multi-dimensional Sonic Adventure 2 Original Sound Track is a two-disc album containing the majority of music present in the Sega Dreamcast game of the same name. Just like its predecessor Sonic Adventure, the main soundtrack was preceded by a vocal mini-album, Cuts Unleashed SA2 Vocal Collection, with only "Escape From the City" and "Live & Learn" being shared between the two. The album included two mini-posters, which contained track information, lyrics, and commentary by the crew behind the music. 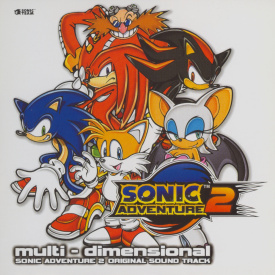 Though Sonic's swan song on the Dreamcast, Sonic Adventure 2 was also one of the few Sonic games to get a soundtrack released in the United States. Instead of containing every track from the list above, Sonic Adventure 2 Official Soundtrack was a single-disc album with only a truncated 26 tracks. The music to Adventure 2 was also re-released to celebrate Sonic's 20th anniversary, the appropriately named Sonic Adventure 2 Original Soundtrack 20th Anniversary Edition only having 30 cuts making it. This page was last edited on 26 October 2018, at 12:36.